Proper deck maintenance is preventative deck maintenance. 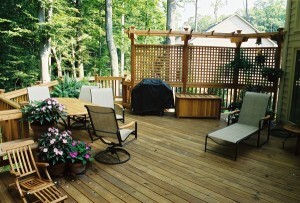 The more seriously you take your deck maintenance, the better your deck will look throughout the year. There’s no question that this year has been a long and exhausting one, and when you crave a getaway from the hectic pace of everyday life, your deck can make for an excellent refuge. Here are four of our favorite deck maintenance tips for taking care of your decks this fall. As is the case for most home maintenance procedures, cleanliness is critical. Keep your deck as clean as you can by cleaning it at regular intervals. These intervals can be every day, every week, or every month. Leaves falling from the trees may look pretty as October continues its inevitable march towards November, but these same leaves won’t look so pretty when they’re clogging up your deck. If you cleaned pollen off your deck during the spring, don’t forget that pollen can be just as problematic during the fall. Clean both the boards and the rails to keep your deck looking its best, and refrain from using chlorine bleach, which can do major damage to your deck. When your deck looks like it’s in need of repairs, it probably is. When it comes to deck maintenance, putting it off is just about the worst thing that you could do. Don’t delay any repairs your deck may need. Making timely repairs will ensure that your deck will last longer, and it also makes sure that a small problem doesn’t become a huge one. If your deck is rotting, that’s another bad sign. Grab a screwdriver with a flat blade. Take the screwdriver outside to your deck and start pushing and prodding at the boards. Pay attention to how deeply the edge sinks in; if it’s a quarter-inch or more, then chances are, you’ve discovered a rot problem. Lastly, you should do all you can to prevent any future problems. Proper deck maintenance is preventative deck maintenance. Once it’s fall, it’s time to get down to business. Get outside and start moving deck furniture and decorations, such as tables, chairs, and planters. Remove any leaves you see, and if trees and bushes are creeping up on your deck, be sure to trim them back.